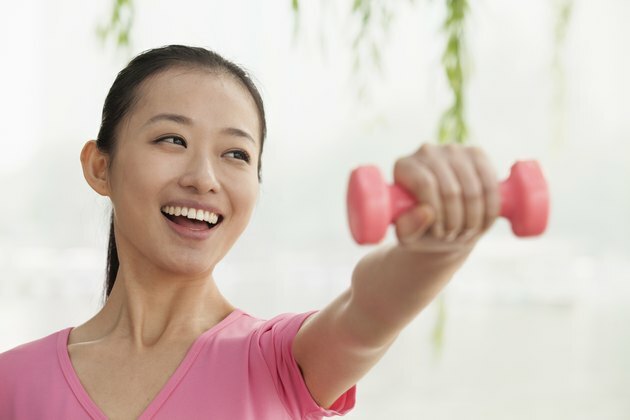 Regular strength training builds strong bones, muscles and connective tissue. The muscular strength and endurance you gain from lifting weights can also make everyday movements, such as carrying groceries or moving boxes at work, feel easier. Dumbbells are among the most versatile strength-training tools, both at home and in the gym. But if you don't have any dumbbells handy, you can work out with a number of alternatives, from other exercise gear to handmade weights. The idea of using cans of food or full water bottles instead of dumbbells might seem trite, but it works -- as long as these light weights feel like a challenge. If you feel like you could go on lifting them forever, or as you get stronger, you'll have to upgrade to heavier alternatives. Once you graduate past the water-bottle stage, milk jugs make a reasonable replacement. Fill the jugs with water, sand, gravel or even cement. The handles aren't as ergonomically correct as dumbbell handles, but you should still be able to get a firm enough grip to maneuver your makeshift weights. Moving up another notch in intensity from the milk jugs, you can fill 5-gallon pails with sand, gravel or cement. For obvious reasons, these work as weights only for leg exercises, rows, and other exercises during which you can hold the bucket by its handle and let it dangle. If you've got a bit of money to invest in weight equipment, consider purchasing kettlebells. These cannonball-shaped weights, with a single loop handle on one end, are built for swinging, ballistic movements. But you can also use them to duplicate almost any classic dumbbell exercise. Barbells take up more space than dumbbells, and require at least a rudimentary rack and a place to store extra weight plates. Ideally, you should have a bench and spotter when working out with barbells. But barbells are still a viable alternative to dumbbells, and can make controlling a large amount of weight easier. You can also use barbells for exercises like jammers -- one of the few things you can't do with a dumbbell. In that exercise, you squat, grab one end of the barbell and stand up onto your toes while raising the end of the bar above your head. Elastic resistance bands are the perfect, packable, portable alternative to dumbbells. Elastic resistance bands are small and light enough to carry in your purse or briefcase when traveling. You can use elastic resistance bands for any exercise you can do with dumbbells, and a few that dumbbells can't manage, such as leg curls and hip extension.